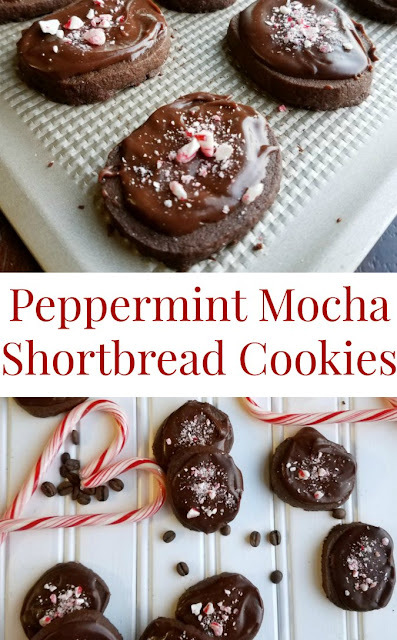 These peppermint mocha shortbread cookies are just like the coffee house drink but in chewable form. Put some on your Christmas cookie trays to take them to the next level! I received a bottle of Neilsen-Massey coffee extract for recipe creation. As always, all opinions are honest and my own. I know plenty of people who are gaga over pumpkin spice lattes. You know the kind. August rolls around and they anxiously await the announcement that they are coming and they run to the coffee shop the first day they are available. Don't get me wrong, I'll very happily drink one if you're bringing it to me. It's rude to say no to delicious things after all. But that is not the flavor I'm anxiously awaiting. Nope, peppermint mocha has the key to my heart! To be honest though, I rarely make it to coffee shops. Life is busy and when it's not busy I'd rather be in jammy pants than coffee shops. Just me? Oh boy, I've probably said too much again! Now that we're done with the part where I tell you way too much about myself, let's learn a bit more about what we're really here for, cookies! 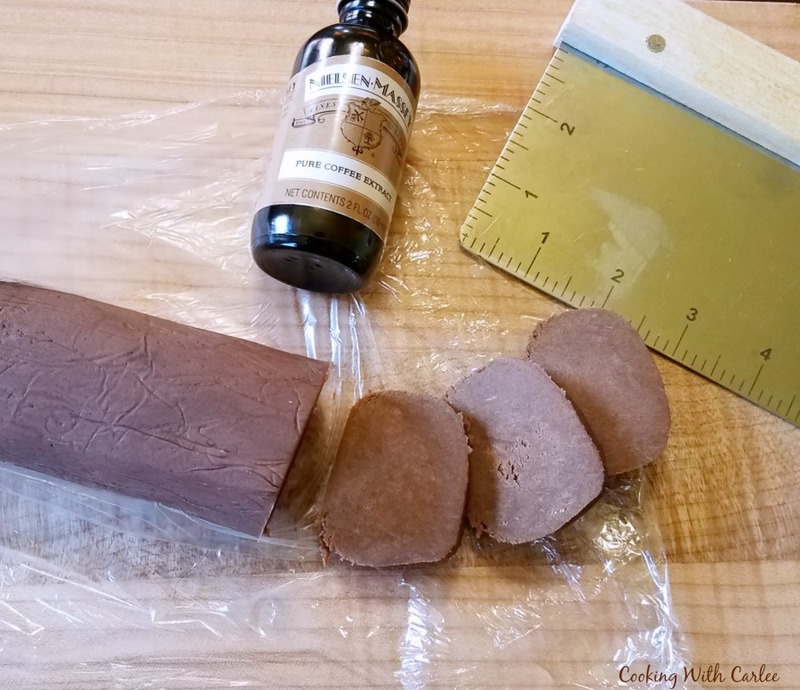 We start with a chocolate shortbread base and add just enough Nielsen-Massey pure coffee extract to give them that deep mocha flavor. Imagine that buttery shortbread bite full of chocolate and coffee flavor. As if that wasn't good enough, I took chocolate frosting I like to use for spreading on stackable cookies and added a couple more drops of coffee extract. 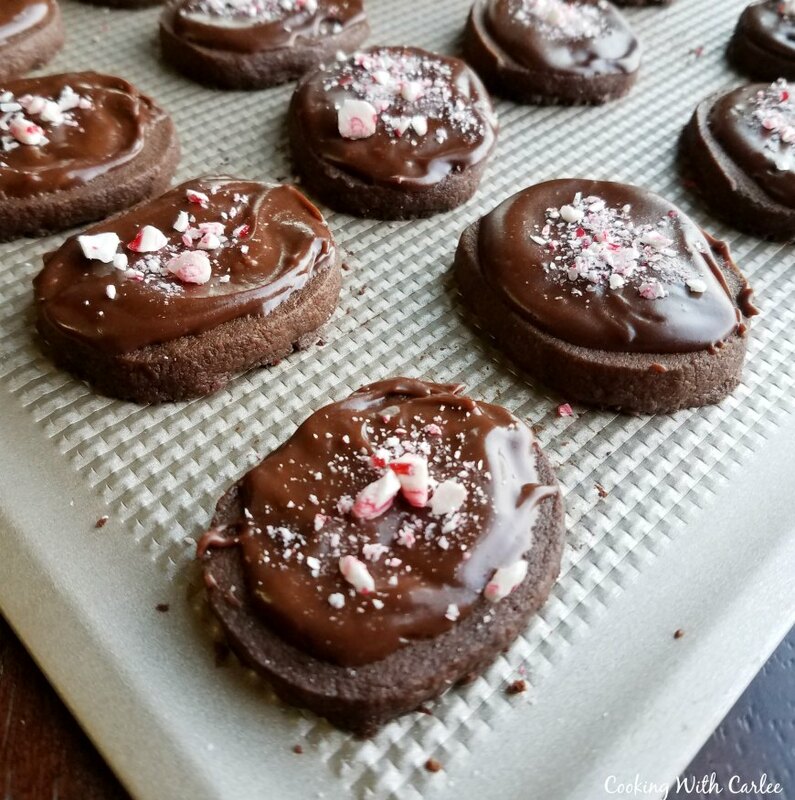 Smooth some over the cooled shortbread and sprinkle with some crushed candy canes for a festive and out of this world delicious treat. I just loved the crumb of the shortbread with the rich creamy frosting. The candy canes are both a festive decoration and the perfect way to add a hint of peppermint flavor without taking it too far. You want it to be there and delicious without punching you in the face. Now go ahead and get to work, there are cookies to be made! I can't wait to see all of the fun cookies my friends are sharing this week. Beat butter until smooth and creamy. Add coffee extract and beat until combined. In a large bowl, whisk together cocoa, powdered sugar, flour and salt until combined and free of clumps. Gently mix dry mix into butter. Beat until just combined. Bring dough together with your hands, kneading it a bit if you need to in order to get it into a cohesive ball. Place it on a large sheet of plastic wrap and roll it into a log about 1 1/2 - 2" in diameter. Wrap tightly in plastic wrap and refrigerate for at least an hour but up to a few days. When ready to bake, preheat oven to 350 F.
Slice dough into disks about 1/4" thick. Bake for about 15 minutes. 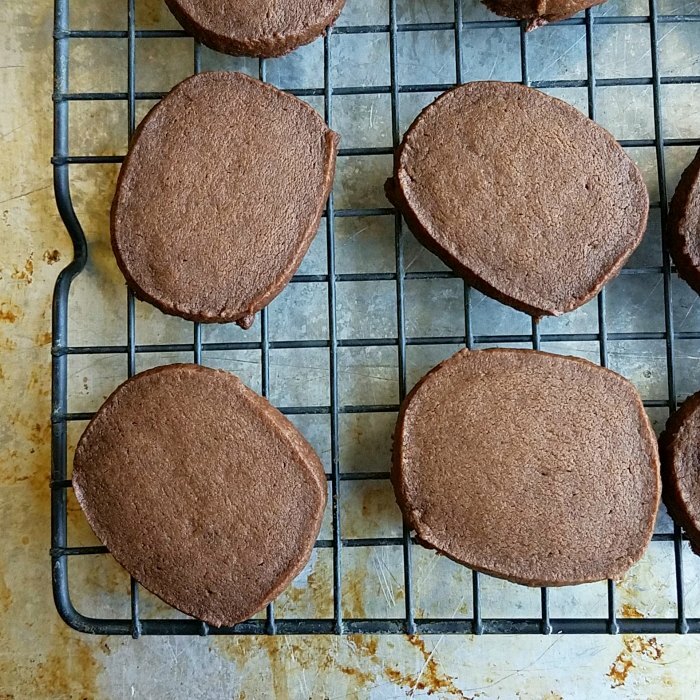 Allow to cool for about 5 minutes on the cookie tray and then remove to a wire rack to cool completely. In a small saucepan over low heat, melt chocolate chips, butter and milk. Be sure to stir constantly and remove from heat once the chips and butter are melted. Whisk in the powdered sugar and coffee extract until smooth. 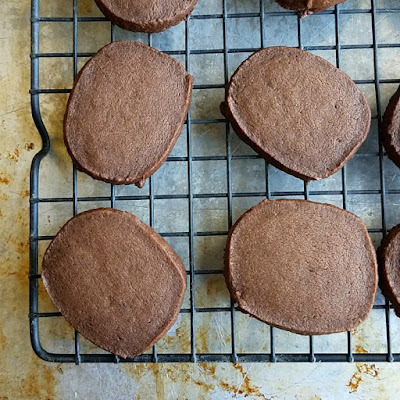 Spread over cooled cookies while the frosting is still warm. Heat it back up a bit as you go if needed to keep it a good spreading consistency. Sprinkle crushed peppermint over the top while the frosting is still wet. 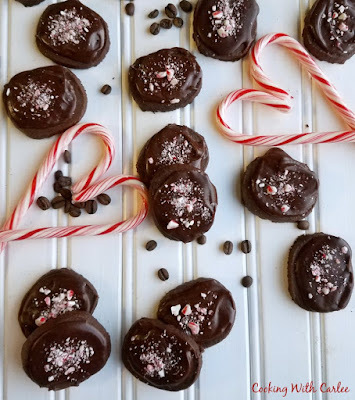 What scrumptious and festive lil chocolatey gems! These are not only cute but sound oh so good! Happy Monday! These cookies are certainly better than the coffee shop drink! 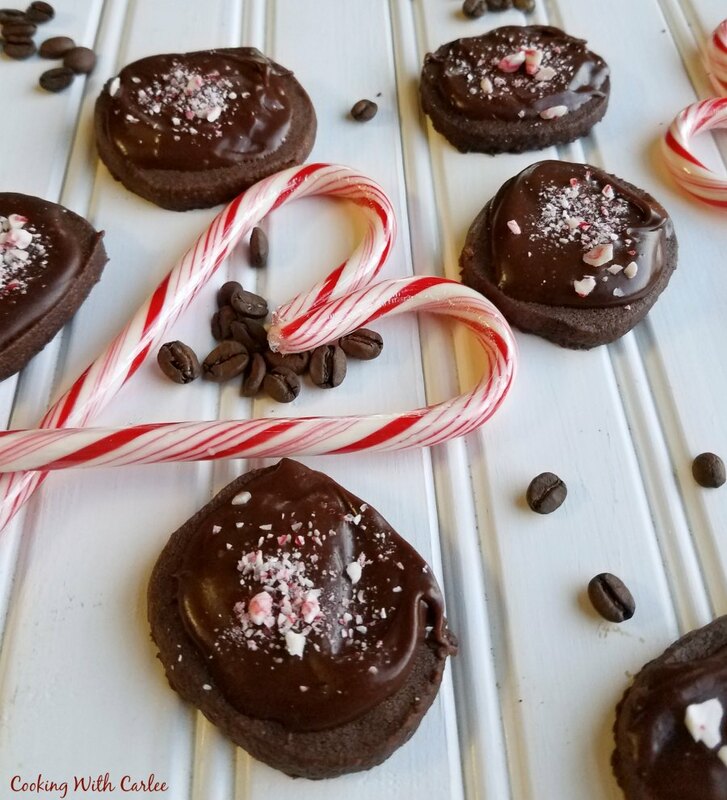 Buttery, chocolatey with a hint of coffee and peppermint! So cute and festive! Thank you! I knew I'd like them before I had a chance to try one, but they still surpassed my expectations! What a beautiful cookie! These are going on the "to try" list! This looks like the perfect amount of peppermint and chocolate and coffee too. Yes, this is my combination. I love pumpkin bread and pie but I'm not really in to the pumpkin drinks. I do enjoy pumpkin baked goods, but give me the peppermint mocha over the PSL any day! Thanks! You had me at mocha and then you went and added peppermint.....be still my heart. Yay! I should have sent you some! So festive! I love using candy canes too! They give the perfect amount of peppermint flavor, don't they? And they make them pretty to boot! They are stackable! That frosting is based off the one I use whenever I want chocolate frosted cookies because it hardens so well but still has a soft feel when you bite it. Chewable coffee drink! That sounds just about right! Love chocolate mint!! Thanks for sharing!!! Me too, especially this time of year! Great recipe! NM has the best extracts!! They really do, don't they? Thanks! Do you completely understand my love for shortbread cookies? you must or you wouldn't tempt me with them like this! Mmmm.. Must make this, Serious Kryptonite! Celebrate365 Cookie Exchange is very lucky to have you posting them! Ha! Thank you so much (and sorry!) I should send you some! I love shortbread!!! But shortbread mocha? Amazing!!! These are going on my Christmas baking list! We will just love your Cookies they look delicious! Hope you have a great week and thanks so much for sharing with us at Full Plate Thursday. Love these shortbread cookies so much! What a perfect addition to #ChristmasCookiesWeek ... they look wonderful!